Everyone is Irish on St. Patrick’s Day…or so the song goes. I went to the parade with my best friend VaRonica and had a blast. We took pictures, met interesting people, went to the Hellenic center festivities, danced a jig and had an all around great time. To see pictures of our fabulous day, just click on the pic and check them out. I would have to say I was impressed with the Irish Wolfhounds of Utah. However, any child wearing a tutu and/or wings is probably in my group of pics. 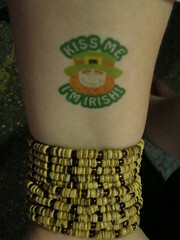 HAPPY ST. PATRICK’S DAY !!!! !